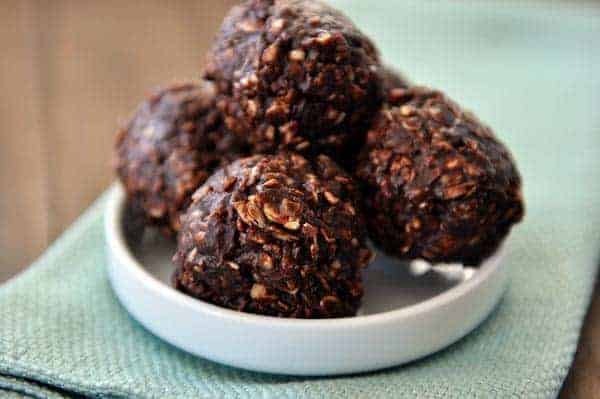 These no-bake, healthy, chocolate granola bites, filled with oats, honey, chocolate and coconut oil, are a delicious alternative to processed snacks! 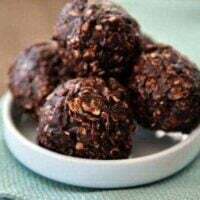 Remember these healthy no-bake granola bites? Yeah, they’re delicious. And easy. And a pretty healthy little snack. The only thing that could make them more desirable is if they were loaded with chocolate. 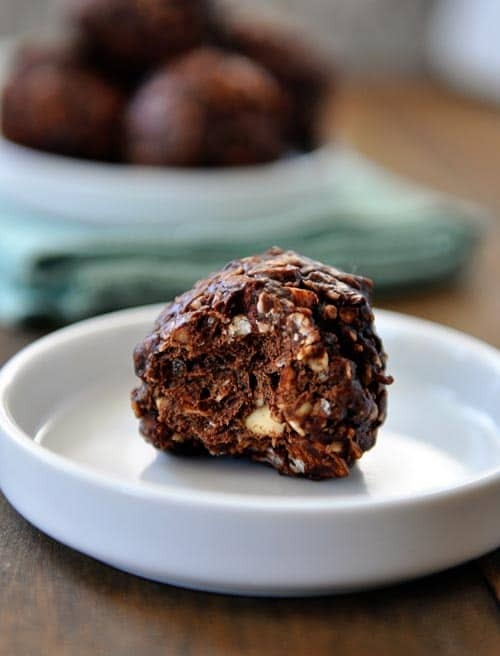 No-Bake Dark Chocolate Granola Bites. Still delicious. Still easy. And still full of healthier ingredients than, say, a double chocolate cookie (not that there is anything wrong with those, by the way). My sister Em sent me this recipe she spent weeks perfecting (I love it when she does that) and I have to say…we can’t get enough of these little granola bites. These babies are loaded with oats, coconut, almonds, cocoa nibs (if that’s your thing) and a creamy mixture of honey, extra-virgin coconut oil, peanut butter, cocoa and a few chocolate chips. Now that I’ve basically laid out for you the ingredient list, you should gather up all the necessities and make these. I tripled the chocolate granola bites batch last time (I’m telling you, they’re good) and they’ve lasted in the refrigerator, still tasting fabulous, for a couple weeks. They make a great afternoon pick-me-up snack for those of you who may be like me and need a little bit of something right around 2:48 p.m. to get you through the rest of the day with peace and love and happiness. I’ve also been popping one into my kids lunches now and then which always ends in hugs and thank you’s and you’re-the-best-mom-evers. These are so simple, my kids are now taking over the making of, the scooping of, and the rolling of…and as a thank you, I’m graciously assisting them with the devouring of. Such a tremendous tasty little treat! If using whole almonds, be sure they are chopped into fairly small pieces. I've made the mistake of leaving the almonds a tad bit too chunky and it makes the granola mixture more difficult to form into balls that stick together. I haven't used regular old-fashioned oats. If you do so, consider pulsing them in a blender or food processor very lightly so they break down just a bit. ﻿If you aren't familiar with cacao nibs, they are basically raw pieces of chocolate that haven't been ground and sweetened yet (they are slightly bitter like cocoa powder). We LOVE this recipe for back to school lunches! Thank you for all your great work on this website. We love your recipes. Any substitution for 1/4 cup extra-virgin coconut oil? You could try another kind of oil or maybe even butter. Albertsons has cocoa nibs. Wouldn’t be surprised if Fred Meyer had them also. Have to add – just made these. Huge home run. Everyone from my husband, to my mom and sister scarfed them down. the kids haven’t tried them yet, but I suspect I’ll have to hide them once they taste them at lunch tomorrow. Can’t wait to make! And instead of cacao nibs and chocolate chips, I’ll use my favorite treat: chocolate covered cacao nibs!! Yum. A perfect afternoon pick me up! I make these by the dozens and freeze them in week-sized portions. Then each week I grab a bag and take it to work. Makes my mid afternoon so much better! Thanks Mel! These were delicious and gobbled up in one sitting. I used pecans instead of almonds since it’s what I had on hand, and I also froze them, and they were scrumptious. Loosely followed your recipe, had no (decent) olive oil or nibs, used small amount of chilli and nutella instead, they’re lovely and east. Also no equipment needed a pan, knife and your hands. Great stuff thanks. Went down a treat! As I made these (subbing almond butter for my peanut-allergic kid), I realized that they’re VERY similar to the Healthier No-Bake Cookies. They’re just a little less sweet and more dense. I’ll take these, since eating several of something called “granola” is more justifiable than eating something dubbed “cookies”. Either way, excellent!! Hi Mel ~ Have you ever tried smooshing these into a pan as bars instead? Just curious, thanks! Ah, yes! Actually I have and they work really well. Made these twice this week! Fabulous. You can use regular oats instead of quick, because that’s all I ever have and they were great! I pulsed the almonds a couple of times in the food processor and got them a little more ground than chopped. This really seemed to help with the rolling process. I found if the almonds are too chunky, they don’t roll as well. Thanks for a super yummy snack! My kids adore you! Just made these yesterday and they’re great!! Thanks for the recipe! Ive been waiting for someone else to ask my dumb question but apparently I’m the only one. What are cacao nibs? Obviously some kind of chocolate pieces but how are they different from chocolate chips? Emily – This is not a stupid question at all. Cacao nibs are raw pieces of chocolate that haven’t been ground and sweetened yet (they are slightly bitter like cocoa powder). They add a yummy depth of flavor and a crunchy texture to these granola bites. Are they easily found? I’ve never looked for them before. Thank you for your wonderful blot! They are definitely becoming more widely available – in a lot of grocery store’s natural foods sections. I buy mine from Amazon. Hope that helps! What brand do you suggest? I read different reviews on Amazon and am hesitant to try some of them but I trust your opinion as you provide some of the best recipes! Lachelle – These are the ones I bought. I haven’t tried many other brands so I can really only speak to this one but I think they are great (as long as you aren’t expecting cacao nibs to taste like sweet chocolate). Woohoo! These aew awesome! 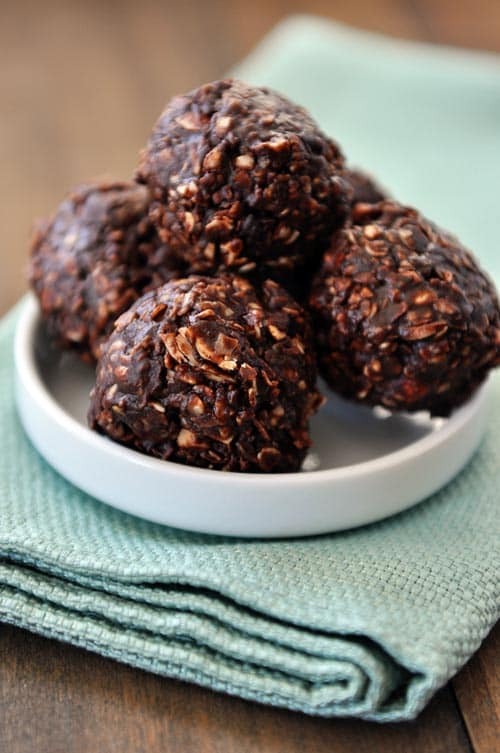 Very similar to the no bake cookie only way more healthy! I went ahead and triples the batch since i have 4 hungry kiddos….. which made exactly 80 using my TBL cookie scoop. Hopefully that’ll last a couple days! I tried these using expeller pressed organic coconut oil (as opposed to extra virgin) & it worked great! Absolutely delicious! Thanks for sharing. I just made these exactly to the recipe, luckily I had everything in the pantry. They are so good! do you think i can use Trader joe’s rolled oats instead of the quick oats. We are gluten free. Sandra – I think rolled oats will work fine as long as you process them a bit in a food processor/blender to have a similar texture to quick oats. These were awesome! I saw them yesterday and decided to make them as an after-school snack for my kids. Okay, really, for me. Everyone gobbled them up. Thank you. Mel, I make your granola ball bites constantly! I need to just buy everything in bulk because we go through them so fast. . . and it’s just my husband, my daughter and me that eat them :0) Ha ha. Thanks for this delicious version. I added coconut and cocoa once to the original when I didn’t have as many chocolate chips, and they were tasty! Thank you for changing my cooking/baking life for the better! Oh boy! These look delicious! We have a constant supply of the original granola bar bites in the freezer, I had to try these! They were oh so good! We might need a constant supply of these in the fridge as well! I just wanted to let you that this site and your recipes are awesome. You have taken the stress of every night cooking away — love love it. Thank you for the time and effort you put into it and for sharing you hard work. I’ve gotta try these! I love chocolate granola and bites like these. These look so good! Hi Mel, I am having trouble printing your yummy recipes. I click on the link and just get a blank page. Any ideas? Shannon – Unfortunately if you are using Internet Explorer, the print function isn’t working right now. I am working to get it fixed but in the meantime, I am encouraging those who are having issues to switch to a different browser like Chrome, Safari or Firefox. Internet Explorer has issues with many website functions and one of those other browsers will be much better (not just for the print function). If you don’t want to switch browsers, know that I am working on it. I’m sorry for any inconvenience! To those of you having problems getting recipe’s printed using Internet Explorer – I have the best solution, one that I use all the time. Ready? Pen and paper always work. I write down most of the recipe’s because the printer is in another room and I’m too lazy to get up to turn it on. Try it! Do you think I could sub maple syrup for the honey?? These look really good! Where do you find/buy cacao nibs? I’ve had them, but never purchased them before. I’m excited to try these! Is there something else I can use in the place of shredded coconut? These sound great, but I’m not s coconut fan…. Hi Cheryl – you could try increasing the oats to compensate for leaving out the coconut or any other slightly crunchy type sub may work (like crisp rice cereal, etc.). Do you use “natural” peanut butter? Sometimes I wonder if it will be too runny but it is all that I buy. Hi Beth – as long as you give the natural peanut butter a really good stir, it should work pretty well. I use the Jif natural brand and it works great (although I think it is slightly less runny than other natural brands). Any chance you know the calories in one of these yummies? Hi Nancy – I sure don’t but I know there are several online calculators that can figure out the nutrition facts on a given recipe. The #2 is older, but #1 is more detailed and it’s my favorite. I just made the no bake healthy granola bites today (the non-chocolate ones) and I can’t stop eating them. Oh my. I hope there are some left by the time my kids get home from school. . .these chocolate ones look great too. I will try those tomorrow 🙂 Thanks Mel! I make your other no bake granola bites like every other week and LOVE THEM! I’m excited to try these! Thank you! Adding chocolate is never a bad idea. Love these little snacks!! Mel, Thank you! The original no bake granola bites are a family favorite. These surely will be too. Also, we need more details on that cute little furry puppy we saw Saturday! Yum! A healthy treat to eat when I am craving chocolate! These look delicious! Any suggestions for a substitute for Coconut oil (hubbie doesn’t like it). Have you tried Expeller Pressed/Refined coconut oil? It has no taste for those who don’t like the flavor of traditional coconut oil. Nancy – you could really use any type of oil or butter – like another commenter suggested, refined coconut oil doesn’t have the same smell and taste of coconut like the extra-virgin so that could be a possibility, too.